Using easy-to-understand text illustrated with classic DC comics art, this thoroughly engaging book covers everything readers need to know, from Superman's Kryptonian roots to his amazing superpowers; from his Justice League pals (including Batman and Green Lantern) to arch-enemy Lex Luthor; and many of his most impressive feats. Beautifully packaged with a printed-foil cover, this is a must-have for every young super hero fan's bookshelf! 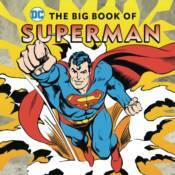 The Big Book of Superman is an ideal introduction to this iconic super hero, perfect for young fans, ages 4 and up.